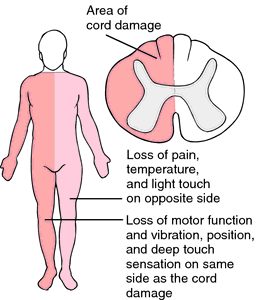 paralysis and loss of discriminatory and joint sensation on one side of the body and of pain and temperature sensation on the other, due to a lesion involving one side of the spinal cord. Brown-Séquard syndrome. From Ignatavicius and Workman, 2002.
syndrome with unilateral spinal cord lesions, proprioception loss and weakness occur ipsilateral to the lesion, while pain and temperature loss occur contralateral. A syndrome caused by damage to the nerves on one side of the spinal cord and resulting in ipsilateral hemiparaplegia and loss of muscle and joint sensation and contralateral hemianesthesia. Syndrome with unilateral spinal cord lesions; proprioception loss and weakness occur ipsilateral to the lesion, whereas pain and temperature loss occur contralaterally. A neurological disorder, caused by compression of one side of the spinal cord in the lower back, featuring paralysis on the injured side and loss of sensation on the other side. (Charles Edouard Brown-Sequard, 1817–1894, Mauritian physician). Charles E., French physiologist and neurologist, 1817-1894.